A new update lets you play as Quiet in Metal Gear Solid 5: The Phantom Pain’s Forward Operating Base missions. The update adds several other changes as well, including new online development items and another difficulty for Event Forward Operating Base missions. Quiet is a sniper who loses to Venom Snake in a duel in Afghanistan. She becomes a prisoner at Mother Base until she proves she can be trusted to work with Diamond Dog personnel. She’s then available as a companion character who can assist the player on missions. 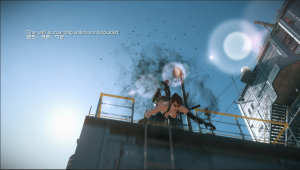 In-game, Quiet’s superhuman abilities cause her to play much differently than Venom Snake. Quiet can aim down sniper rifle scopes with minimal shaking, and can run faster. She can also jump up to ledges where Venom Snake would normally need a ladder, dash forward, and go invisible when completely still. 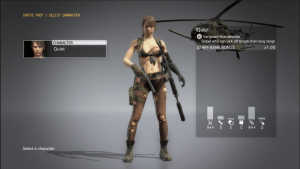 On account of the parasite, you won’t be able to change Quiet’s head options or uniform while playing as her. 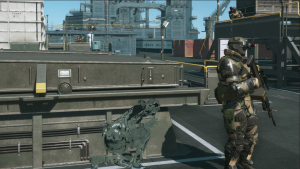 The new development items provide additional support for Metal Gear Solid 5’s missions. Five items have been added: two sniper rifles, a dark matter generator, a stun dark matter generator, and an energy wall. The two sniper rifles are variants of the same firearm, one is lethal and the other is not. The dark matter generator creates a black cloud that kills any enemy that comes close, while the stun dark matter generator only knocks enemies out. The energy shield can block anything, but will eventually dissipate if it takes too many hits. All of the new items are only available in Forward Operating Base missions. The new update also adds a hard difficulty to Event Forward Operating Base missions and fixes a few bugs. The full details of the update can be found on Konami’s blog.